Ten years ago, the University of Calgary Press published a very fine book by Christine Mason Sutherland called The Eloquence of Mary Astell, which focused on the proto-feminist's contributions as a rhetorician. The cover for the book featured a compelling image using a painted sketch from 1760-1765 by the master English portraitist Sir Joshua Reynolds, currently in Vienna's Kunsthistorisches Museum and known as Bildnisstudie einer jungen Dame (Study for the portrait of a young woman). Cover images from books circulate widely on the internet. They are featured in online bookstores, they get picked up by search engines. Inevitably, they get re-used and separated from their context. 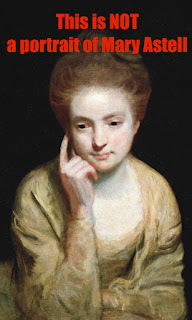 Today (2015) "teh Internetz" firmly believe that the cover image is a portrait of Mary Astell. If you look carefully, you'll see that the image most frequently used is the book cover with the title inexpertly removed. No portrait of her remains, but such evidence as we have suggests that she was not particularly attractive. Lady Mary Wortley Montagu’s granddaughter records her as having been “in outward form [...] rather ill-favoured and forbidding,” though Astell was long past her youth when this observation was made. Wikipedia has successfully resisted the misattribution. A contributing factor for the confusion about Mary Astell's image is the book's failure to attribute the cover art. Typically a cover description is included in the front matter of the book. According to the Director of the University of Calgary Press, Brian Scrivener, proper attribution would certainly be done in a book produced today. Publishers now recognize that metadata is increasingly the cement that makes books part of the digital environment. Small presses often struggle to bring their back lists up to date, and publishers both large and small have "metadata debt" from past oversights, mergers, reorganizations and lack of resources. Managing cover art and permissions for included graphics is often an expensive headache for digital books, particularly for Open Access works. I've previously written about the importance of clear licensing statements and front matter in ebooks. It's unfortunate when public domain art is not recognized as such, as in Eloquence, but nobody's perfect. The good news is that University of Calgary Press has embraced Open Access ebooks in a big way. The Eloquence of Mary Astell and 64 other books are already available, making Calgary one of the world's leading publishers of Open Access ebooks. Twelve more are in the works. You can find Eloquence at the Calgary University Press website (including the print edition), Unglue.it, DOAB, and Internet Archive. Mary Astell's 1706 pamphlet Reflections Upon Marriage can be found at the Internet Archive and at the University of Pennsylvania's Celebration of Women Writers. And maybe in 2025, teh internetz will know all about Sir Joshua Reynold's famous painting, Not Mary Astell. Happy Open Access Week!